At Trail Creek near Jackson, Wyo. It was a good weekend of early-season ski racing for 34 Sun Valley Ski Education Foundation cross-country skiers Friday and Saturday at Trail Creek Nordic Center near the base of Teton Pass. There, the three-event qualifying process kicked off just west of Jackson Hole, Wyo. for March’s U.S. Ski and Snowboard Association (USSA) Cross-Country Junior National Ski Championships set for Stowe, Vt. March 1-8. Sun Valley boasted four podiums and two race victories in Friday’s 5-kilometer classic races. The SVSEF group added four more podiums and three wins in Saturday’s 10k and 5k freestyle mass start races that featured snow, heavy at times. By far the strongest SVSEF effort came from its spirited group of 12 boys in the U-16 age class (ages 14-15). Zach Williams, 14, led the U-16 boys in 14:33 and topped a 1-2-3-4 Sun Valley sweep of the top spots in Friday’s 5k classic race with a 21-second victory. In all, SVSEF placed six of its 12 boys in the top seven of that event. Saturday, 15-year-old Peter Wolter (14:56) moved up from his second-place classic finish to win the U-16 boys’ 5k skate by just six seconds over second-place teammate Eli Jensen, 15. Meanwhile, 12-year-old Ella Wolter took first place in U-14 girls’ 3k skate. Sarah Williams podiumed twice with third places in the U-20 women’s group (ages 18-19). 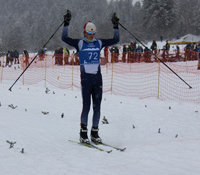 Carter Ros placed third in the U-16 boys’ classic event. Kate Horowitz, 11, won the 2k U-12 girls’ classic and skate races at Trail Creek. Just missing podiums with fourth places were Stephen Pfeiffer U-20 freestyle, Katerina Paul U-18 classic, Eli Jensen U-16 boys’ classic and Ella Wolter U-14 girls’ classic. Next two Junior National qualifiers are Jan. 25-26 at the Lake Creek trail system north of Ketchum and Feb. 5-8 at Soldier Hollow, Utah. Junior Nationals are 67 days away, from March 3-8 at Stowe’s Trapp Family Lodge. Classic interval start competition is Monday, March 3, followed by classic sprints March 5, mass start freestyle March 7 and freestyle relay March 8. · U-20 women (ages 18-19), 5k: 3—Sarah Williams 19:09 (2:12 back). · U-20 men, 5k: 7—Stephen Pfeiffer 14:27 (0:40 back). 10—Andrew Graves 15:11. · U-18 girls (16-17), 5k: 4—Katerina Paul 17:11 (0:59 back). 5—Katie Feldman 17:12. 12—Haley Montgomery 17:46. 13—Grace Gorham 18:18. 18—Loni Unser 19:11. 27—Cheyanne Stopol 21:05. · U-18 boys, 5k: 9—Cole Greenberg 14:38 (1:22 back). 12—Danny Graves 14:51. 13—Thomas Gillespie 14:57. 15—Nate Thomas 14:59. 25—Nate Nasvik 16:12. 32—Derek Thompson 17:24. · U-16 girls (14-15), 5k: 6—Annika Landis 18:05 (2:01 back). 16—Emily Siegel 19:14. DNF—Ellie Polk. · U-16 boys, 5k: 1—Zach Williams 14:33. 2—Peter Wolter 14:54 (0:21 back). 3—Carter Ros 15:03.2. 4—Eli Jensen 15:03.5. 6—River Vorse 15:11. 7—Benjamin Brunelle 15:20. 13—Jacob Truxal 16:04. 24—Cooper Roquet 17:03. 25—Keene Morawitz 17:07. 28—Taylor Koth 17:14. 40—Max Tanous 19:27. 47—Kiran Merchant 22:21. · U-14 girls (12-13), 3k: 4—Ella Wolter 12:01 (0:40 back). 7—Kirsys Campbell 12:34. · U-12 girls (10-11), 2k: 1—Kate Horowitz 10:06. · U-20 women (ages 18-19), 10k: 3—Sarah Williams 38:44 (1:28 back). · U-20 men, 10k: 4—Stephen Pfeiffer 30:01 (1:05 back). 9—Jake Adicoff 31:40. DNF—Andrew Graves. · U-18 girls (16-17), 10k: 9—Haley Montgomery 36:25 (2:25 back). 10—Katie Feldman 37:33. 17—Grace Gorham 39:12. 20—Loni Unser 39:57. 34—Cheyanne Stopol 47:29. DNF—Katerina Paul. · U-18 boys, 10k: 7—Danny Graves 30:29 (2:32 back). 9—Thomas Gillespie 30:38. 10—Cole Greenberg 31:08. 19—Nate Nasvik 32:36. 31—Derek Thompson 37:24. DNF—Nate Thomas. · U-16 girls (14-15), 5k: 12—Annika Landis 18:21 (2:14 back). 20—Emily Siegel 19:22. 35—Ellie Polk 23:25. · U-16 boys, 5k: 1—Peter Wolter 14:56. 2—Eli Jensen 15:02 (0:06 back). 7—Benjamin Brunelle 15:33. 8—Carter Ros 15:40. 13—Jacob Truxal 15:56.1. 14—River Vorse 15:56.6. 21—Cooper Roquet 16:41. 28—Keene Morawitz 17:20. 34—Taylor Koth 18:08. 39—Max Tanous 18:50. 47—Kiran Merchant 24:19. DNF—Zach Williams. · U-14 girls (12-13), 3k: 1—Ella Wolter 10:53. 6—Kirsys Campbell 11:37 (0:43 back). · U-12 girls (10-11), 2k: 1—Kate Horowitz 9:03.